Of Two Minds - Yet Another Chart That Whimpers "Recession"
It's worthwhile recalling that mainstream economists, the Federal Reserve, government agencies and the mainstream financial media all deny the economy is in recession until it falls off a cliff. Zero Hedge recently published an overview of charts that also spell recession: The US Is In Recession According To These 7 Charts. Mish has provided evidence that a recession has already started: Household Spending Growth Expectations Plunge; Recession Already Started? Because U.S. economic and financial conditions tend to be highly correlated, we also present an alternative index, the adjusted NFCI (ANFCI). This index isolates a component of financial conditions uncorrelated with economic conditions to provide an update on financial conditions relative to current economic conditions. The chart also displays the spread between Baa-rated corporate bond yields (Baa bonds are just above junk bonds, which are typically rated BB or lower) and 10-year Treasury bond yields. 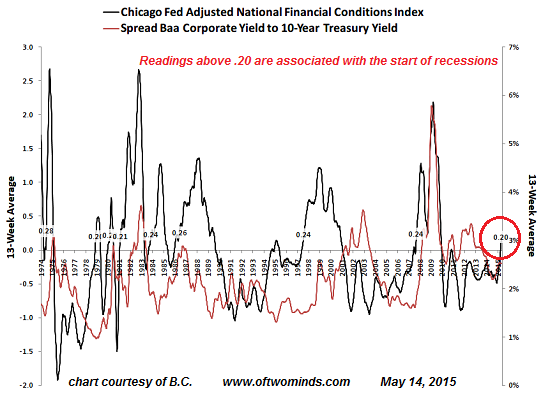 Widening spreads between corporate bonds and Treasuries are associated with recessions, as are ANFCI readings above zero. The current reading is .20, a level that correlates to deteriorating financial conditions and the early stages of recessions. The more dependent the economy is on financialization, the greater the impact of deteriorating financial conditions. To a large degree, the U.S. economy's apparent strength is an illusion based on extremes of financialization: rampant Fed monetization of Treasury debt and mortgages, extremes of leverage and speculation that have inflated asset bubbles that have created a wealth effect that is limited to the top 10% of households, and is highly concentrated in the top .01% of households. How Wall Street Devoured Corporate America. 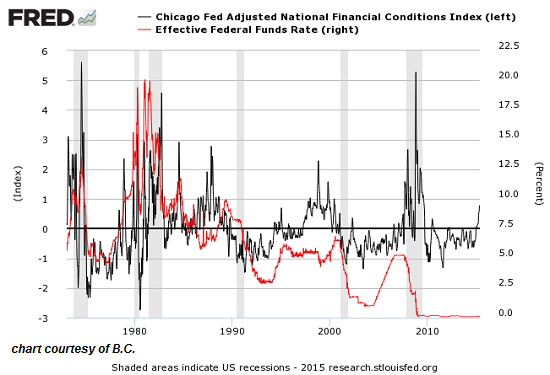 Here is the ANFCI and the Fed Funds rate, which has been near-zero for years. What can we say about an economy that requires zero-interest rates as the New Normal? How can anyone claim this is a healthy, robust economy if tepid expansion depends entirely on unprecedented zero rates, unprecedented Federal Reserve monetization/asset purchases and a highly asymmetric wealth effect that has widened income and wealth inequality? At this juncture, it's worthwhile recalling that mainstream economists, the Federal Reserve, government agencies and the mainstream financial media all deny the economy is in recession until it falls off a cliff. Only after a recession can no longer be denied will the organs of propaganda concede that the economy is indeed mired in a recession. When the organs of propaganda finally concede that the economy is in recession, they inevitably fight the last war: whatever worked in the past is repeated, even though the next recession will be an entirely new financial battlefield. Repeating what worked in late 2008-early 2009 will fail, and fail catastrophically, because conditions have changed. Thank you, Roger H. ($30), for your splendidly generous contribution to this site-- I am greatly honored by your steadfast support and readership.